Gah! Sculpting Hypertext is harder than it looks! The towpath continues to old Parvis Bridge where the navigation widens to allow barges to turn after loading or unloading. Built in 1760 and, although much altered over the years, it retains the typical appearance of a late eighteenth century winged brick bridge. 250 years ago the area was full of activity with wharves servicing six mills. In the mid-nineteenth century James Yeowell, described as grocer, mealman and coal merchant, carried on his business here for many years. Now only the weather-boarded grist mill survives. Next comes Murray’s Bridge which dates back to the very early days of the navigation and was rebuilt in 1761. It was across this bridge that the parishioners of Byfleet’s St Mary’s Church would walk in Victorian times to attend an annual garden party in the grounds of West Hall where local philanthropist, Frederick Stoop, lived. The red brick country house stands downstream of the bridge on the west bank. Dodd’s Bridge follows; its footpath leads to West Byfleet. So the simplest iteration of a Hypertext version which delivers the paragraphs in the correct order whichever direction the walker is going along the towpath. As you can see from the above two paragraphs, if I were to edit out the very last sentence, referring to Dodd’s Bridge, the paragraphs would work reasonably well, whichever order they came in. In sculptural hypertext, where all the nodes (or cards if you prefer that metaphore) are connected to all the others, you use node rules, to hide the connections until certain conditions have been met. In HypeDyn, the easiest way of making the link visible between these two paragraphs would be to create a node rule for each one such as (for Murray’s Bridge): IF NODE “PARVIS BRIDGE” [is] PREVIOUS NODE THEN ENABLE LINKS TO THIS NODE. That would work for people coming upstream, and for those walking in the other direction you’d have a rule on Parvis Bridge like: IF NODE “MURRAY’S BRIDGE” [is] PREVIOUS NODE THEN ENABLE LINKS TO THIS NODE. All well and good, and if my ambition was simply to create a Hypertext of a walk of either direction along the Navigations, I’d be done by now. But I wanted to be cleverer than that. Jill has written a great introduction that tells the story of the Navigations, from their creation in the seventeenth century to their acquisition by the National Trust. I’m looking about how story works in space, so I want to have a go at not telling that story all in one lump, as the guidebook would, but to experiment with telling it along the walk, in a dynamic way, so that however far you were walking, would have to opportunity to read the whole story, but if you were walking past the right places, certain parts of the story would be triggered by particular places, as well as by what you’d already read. I also wanted to make the text more dynamic, so that I didn’t have to edit out lines like “Dodd’s Bridge follows…” but could instead choose to show them only if people were walking in the right direction, or even show alternative text when people were walking in opposite direction. This second challenge is easier to solve. In sculptural hypertext, the ability to create links on each node is made pretty much redundant by the facts that all nodes are linked to all the others unless the links are sculpted away by the node rules. But HypeDyn allows the author to use the link function to create alternative text, that only appears when certain conditions are met. When there is no destination set, the additional text doesn’t look like a link to the reader. 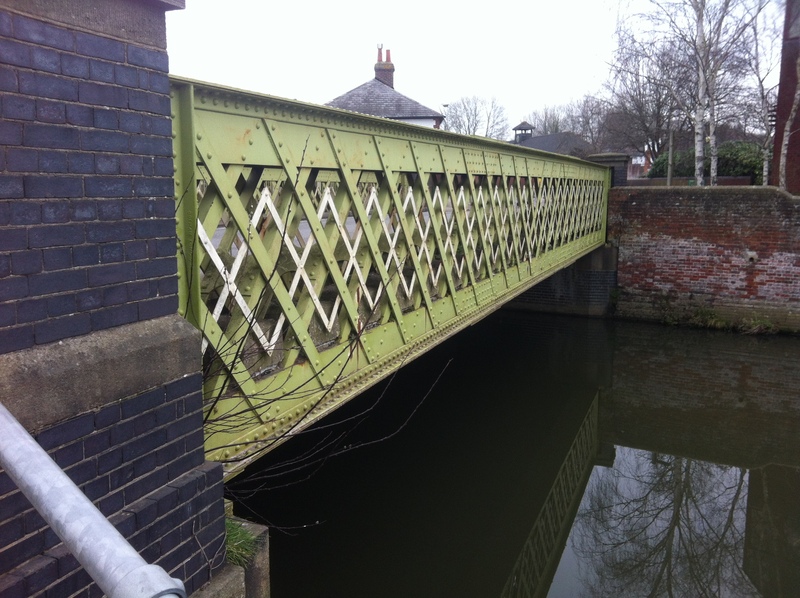 So for example, you could include the text about Dodds’s bridge in the Murray’s bridge node, but make it a link which you can only see is you are walking upstream from Parvis Bridge. For for those walking downstream, the sentence would be replaced by a blank space. You can also set “Facts” in the node rules. There are two types of Fact. The first is a simple True/False flag. The second is a “text fact” which can be used to set the alternative text for the links on other cards. Sadly that’s all it can be used for. I spent an hour or more yesterday creating Text Facts what I was going to use in the rule conditions for displaying the “story” nodes among the “place” nodes. Only after I’d done all that work did I try and set a rule using a Text Fact. And that’s when I discovered you could only use the True/False Facts in rule conditions. You’ll guess from my post title, that when I started to write this, I was ready to rant at the limitations and inadequacies of HypeDyn as a tool. And for a chunk of the day today I’ve been moping over the demise of HyperCard. But HyperCard was a pretty expensive programme (even at the student price I got when I bought it) and HypeDyn is free. And actually (as writing this post has made me realize) the trouble with HypeDyn is my own technique – I should have tested my idea out on a couple of nodes, rather than waste time setting up the Facts for all the nodes. Something about bad workers and tools comes to mind. Still its been a learning experience (even if someone else would have learned the same lesson in less hours) and that’s what I’m here for, so I can’t complain. Previous Post My day-job brings archaeological story to the headlines and inspires comedy!